Bring water to boil in a vessel, add a pinch of salt, vinegar and oil. Add spinach and cook for 2-3 minute. Strain and keep aside to Cool. Make puree of that parboiled spinach. Keep aside. Cut paneer in to small pieces, shallow fry and set aside. Heat oil, add Kasoori Methi, Cloves, Cinnamon, Cardamoms and Mace. Add onion Paste and cook for 3-4 minutes. Add Ginger and Garlic paste. Add a pinch of White pepper and Tomato puree. Cook for 3-4 minutes. Add cream. Add spinach puree, red chili powder and enough water. Cook for 4-5 minutes. Add paneer. Season with salt to taste, continue cooking for 3-4 minutes. Add a pinch of sugar. Add butter and cream on top. Serve hot. why vinegar has to be added while boiling spinach? I have made it. Its very nice. More nice than i had in my favourite resturants. One more tip let the oil come out before you add palak puree it will give very nice flavour. This tip was given by my sister in india. Thank u Khana Khazana. Instead of frying paneer, it could be soaked in hot water for ten minutes, taste like fresh, even if it is frozen. This is a very nice recepie well can also add some boiled and cubed potatoesbefore grinding it thickens the palak paneer. Seems good so I need to try it out. 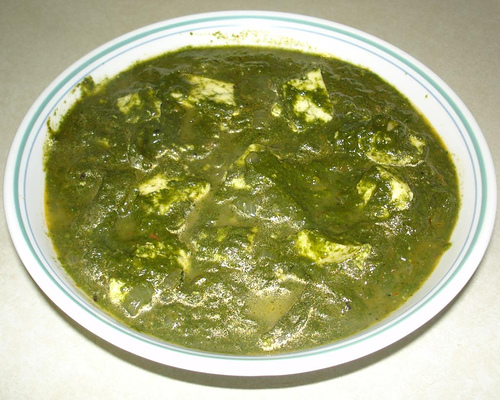 Is Palak Paneer a non-vegetarian item?